Painted Turtle Book, 9780814332702, 121pp. Detroit's architecture reflects Detroit's role in the early years of the twentieth century as the country's leading industrial center, the place where, with the rise of the automobile industry, the future was happening. The metropolitan Detroit area was also home to some of the largest private fortunes assembled in the modern age. All of this is visible in the cutting-edge structures built to serve the needs of the modern business community that was committed to innovation and new processes. Detroit's public buildings-its museums, libraries, schools, and monuments-are second to none in terms of their overall scale, materials, and detailing. Hotels, stores, theaters, and other commercial venues display a breezy cosmopolitanism consistent with the city's position as both a technology hub and a crossroads of immigration. Yet despite this remarkable legacy, many of downtown Detroit's architecturally significant buildings are under threat of demolition and have been placed on the National Trust for Historic Preservation's 2005 list of America's most endangered landmarks. 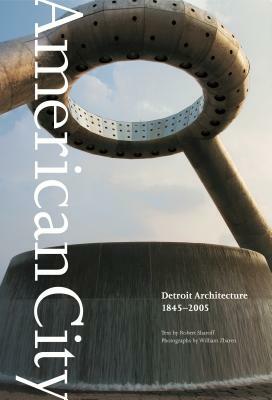 American City: Detroit Architecture, 1845-2005 is intended to showcase a Detroit that might surprise many readers and bring long-overdue attention to the city's heritage of fine design. In 90 stunning full-color photographs, the book documents the innovative features of fifty of Detroit's most impressive buildings. An introductory essay offers an overview of the city's architectural history and outlines the social forces and the personalities that helped shape the city's built environment. The heart of American City, however, is the photography, which brings Detroit's architecture to life in gorgeous detail. Accompanying text identifies each building and provides basic information such as date, location, and architect, pointing out features that make the building of particular interest and importance. William Zbaren's photographs have appeared in the New York Times and other national publications. His work has also been featured in several gallery exhibitions. As a designer, he has worked on numerous national advertising and corporate image campaigns.Robert Sharoff writes about architecture and real estate for the New York Times, Chicago Magazine, and other publications.